Our product range includes a wide range of grease lubrication system and manual grease guns/pneumatic grease gun. Manufacture grease lubrication system, to supply lubricant (oil or grease)in even metered quantity, irrespective of pipelines and back- pressure to all points in a machine or plant through a single point, of a distributor block, situated at a convenient assessable position driven by means of a simple grease gun, or their special high pressure lubrication pump or any hydraulic line of pump. Examples of common application are Presses, Textile machinery, including looms, stenters, Texturing M/c, blow room, spinning, carding, etc. 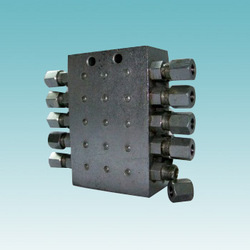 Plastic Processing machinery, Earth moving equipment, Over head cranes, Packing machinery, filling machinery for the beverage industry, printing machinery, CNC machinery, and many other machinery where more than one point have to be lubricated. We are instrumental in offering our clients with manual grease guns and pneumatic grease guns that are used in lubrication systems for oil and grease application in the machines. Available in hand pneumatic, hydraulic and motorized drive these grease guns can grease up to 8 points with a single point pump. These grease guns can be operated independently or in conjunction with the progressive type systems, multi line systems, dual line systems or single line systems. 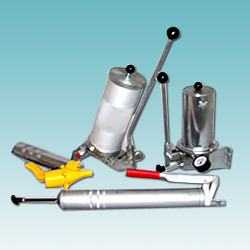 Our grease guns are portable and adaptable that facilitates easy greasing without any spillage. These grease guns are provided with metal container for anti breakage and telltale rod for easy monitoring of the lubricant quantity, which allows a pressure rating of 3500 psi. Looking for Grease Lubrication System ?